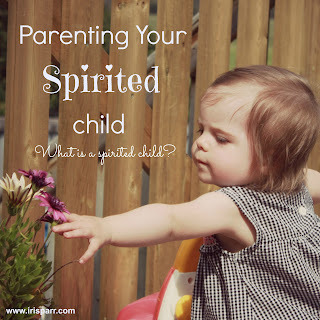 Parenting Your Spirited Child: What is a Spirited Child? "The word that distinguishes spirited children from other children is the word MORE. with a depth and range not available to other children"
~Mary Sheedy Kurcinka, Raising Your Spirited Child. Olivia entered this world with an ear piercing, paint peeling scream. From the moment she entered this world it seems that she knows what she likes and doesn't like and so far her way of communicating this is a scream. Hopefully she will outgrow this once verbal language develops. She is extremely aware of her surroundings, especially the people in her surroundings. She doesn't need as much sleep as other babies need and still does not sleep through the night at 15 months of age. She is an active, high energy little girl who skips that lazy first stage of waking up and is ready to go from the moment she wakes up. To get her to sleep, all distractions must be blocked out or she gets this wild, wide-eyed look and starts a non-consolable screaming cry. A sure sign that we pushed things too far and she is o.v.e.r. t.i.r.e.d. She is also a super cute (we might be biased), incredibly sweet, sensitive, loving little girl. She loves to cuddle when she wakes up (for a very short amount of time) and loves to interact with the people around her. She is very aware of everything that is happening around her and doesn't want to miss out on anything at all. Our precious Olivia is a textbook spirited child. But what does this mean? Is this a nice way of saying "trouble maker" or "little hellion" or "high needs"? Some people may think so. But I refuse to allow these labels to define my child. ...is often very active with a lot of energy. ...is often intense, meaning tantrums are expected and frequent. ...often needs less sleep than the average child and doesn't sleep through the night for quite some time. ...is often irregular and doesn't adapt well to consistent routine. ...is often perceptive. This child will notice little details and seem distracted and even be blamed for not listening because of this perceptive distraction. ...is often persistent. They do not give up easily. This can be a good thing and a bad thing. ...is often sensitive. This can be on an emotional level as well as on an over-stimulated, hyper-sensitive level. This makes for a very compassionate individual. ...is often uncomfortable with change. Many have issues with separation anxiety when they are young. The classic 'clingy' child. This list of characteristics can be overwhelming and even discouraging. It was to me at first. To be in constant battle with your child is hard on a parent's spirit and sometimes at the end of the day you wonder why you even bothered trying. That is how I have often felt in the past year or so in dealing with our spirited baby and now toddler. For a very difficult time period I felt like a complete failure as a parent and dreaded looking at the years ahead of dealing with all this negativity day in and day out. Week in and week out. Month in and month out...for years. Then I realized that I needed to check my attitude. I am the adult here. In the past, when things get tough I have gone to the One who gives me strength. I have laid my burdens at His feet and He has given me strength and shown me where to go for the help and encouragement I need. So, that's what I did. I started praying to God for wisdom and guidance and I am receiving that. Ask and you will receive. Knock and the door will be opened. Right? I have come to see that some of the personality traits that Olivia possesses are common to the spirited child and understanding these characteristics is helping me become a better parent to Olivia. We can take these characteristics and mold them in a positive light. I know that I am only at the beginning of this journey with our spirited child and there are those of you out there who are further along in the journey. I would love your input because I am truly a newbie at this. Join me on my next little mini series as I share what God is showing me in regards to raising our precious spirited daughter to grow into a strong, compassionate woman of God. 13 years later all these helpful books come out. When we were in the process of raising my spirited child (still am, she is near 14). I had James Dobson strong willed child (this was her times 50and another book "The out of Sync Child". James Dobson was so so, the other was wonderful! We have been (still are) through the blaming ourselves games, the tears, the fights, the hopelessness, the oh how good it is they are finally sleeping, the lack of understanding from family and friends... Good for you for searching out ways to cope, finding strategies that work, even if only for 1 day. Keep up the great parenting! Thanks, CityCowGirl! I bet you I will be wanting to sit down for coffee with you in 13 years when Olivia is where your daughter is at right now ;) Love that you left a comment! Feels a bit crazy vulnerable putting this out there. Persistence: She is the most disciplined person in our family. Her room is out of control organized - you would love it!!! I should send you a picture of her closet. We got back from a week long trip to the US and she had gotten some new clothes. The FIRST thing she did when she got home was clean out space in her closet for her new clothes and reorganized everything. And it wasn't even messy. She didn't come out for about 2 hours. Her room always looks perfect and I never have to say a word. She in so dedicated in everything she does and she sees most things through to the end. Sensitive: She is so kind to all the kids in her class. She includes them and draws them all in. I don't get to see this part of her, but her teachers say this is who she is at school. She is sensitive to the feelings of those around her and tries to identify with them. Intense: She is passionate and highly entertaining. She can mimic peoples accents and voices and get a room of adults laughing at her stories. This draws people in to her and makes them want to be around her. Love this series and love it that you're putting yourself out there. Thanks, Monica. I love all that you've learned about A. So inspiring. So positive. I know there are days, weeks and months that are tough, but knowing that there are days, weeks and months that are great is so encouraging. I followed you here from your comment on Joyce's blog. I have raised a spirited child, and she is now 20 and doing very well - but oh how well I remember the sleep deprivation and the tantrums. I LOVE the description by Mary Sheedy Kurcinka. I did NOT like the Dobson advice, if I remember, he advocates spanking. I even tried that, for a short period and it was horrid. You may have heard that the strong willed child will be less susceptible to peer pressure in their teen years, and I have to say it was true for mine - she did what SHE wanted. It was great. I agree with Janice - my Spirited girl is now 17 - an absolute gem. We still have our moments, but being her mom is a great gift. I remember feeling exhausted and completely at the end of my rope when she was little though. I did a lot of praying for guidance too.... still do! Thank you for sharing, Iris! A lot of what you wrote resonates with me as it describes my son. 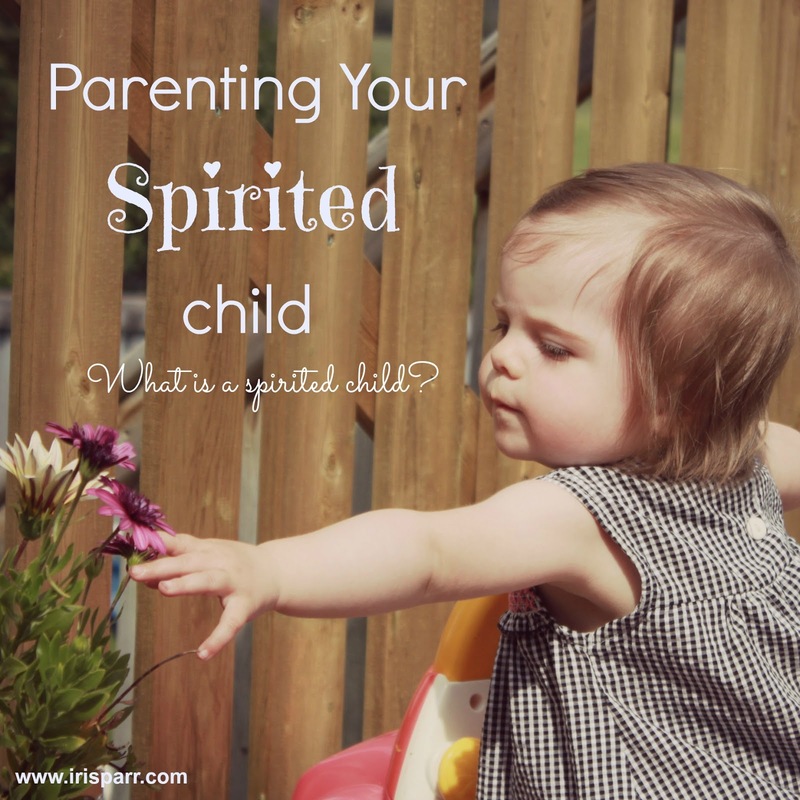 It is encouraging to know of other children who are spirited and to not feel so alone in parenting them. The key is praying and realizing you can't do it on your own strength. I'm going to look into these resources, so thanks again!